The Rawlings Conservatory greenhouses are in distinct climates that allow for the display of plants from all over the world. The Conservatory introduces the world’s flora to visitors who may experience the plants in conditions close to their natural environments. The mild Mediterranean greenhouse replicates the dry summers and foggy winters of the Mediterranean basin and southern California. The Tropical Forest greenhouse displays plants that originate in the tropics, including those native to parts of Africa, Asia, the Americas, Australia, and some tropical islands. The Desert greenhouse showcases plants that can endure the harsh, windy, and arid conditions of the desert where daytime temperatures can climb as high as 125 degrees Fahrenheit and fall as low as 10 degrees at night, with little rainfall. The Orchid Room features the largest of all the plant groups, which includes over 30,000 species and more than 100,000 registered hybrids. The Palm House grants the visitor an opportunity to return to the Victorian era. Standard Hours: Wednesday through Sunday, 10 a.m. – 4 p.m.
We are closed Thanksgiving and Christmas day. 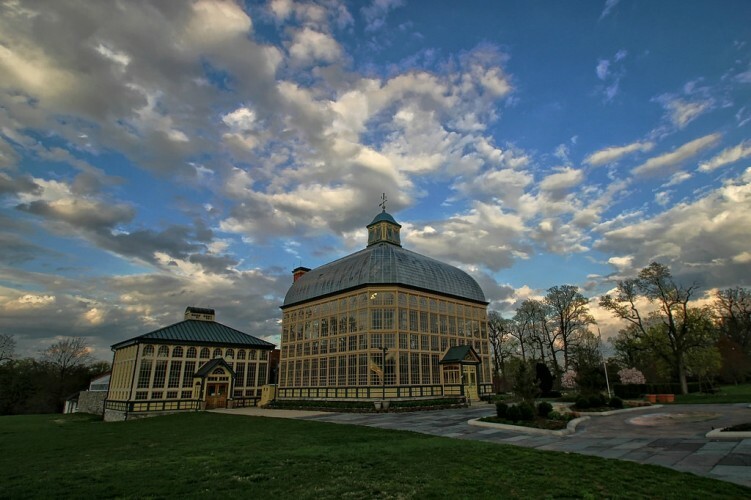 The Conservatory is located off I-83, exit 7, near the Maryland Zoo. We are in Druid Hill Park, near the intersection of McCulloh Street and Gwynns Falls Parkway.